History counts out the chapter-play after mid-fifties stoppage of production, but parts of the country kept getting them well into a following decade. NC theatres used serials for kiddie mornings until TV's Batman rendered them laughable. The last I found in close-by ad morgues was a 1966 Greensboro run of The Purple Monster Strikes at one house's Sat morn "Circle K Club" meets. There was also Col. Forehand's sentimental journey that same summer with Panther Girl Of The Kongo at the Liberty, a punk sampling, but maybe all he could get by that time. Plenty surreal was watching a PG chapter with latest out of Hammer and AIP, then arrival home in time to catch the week's installment of Mysterious Dr. Satan on Channel 12 out of Winston-Salem, this hosted by genial station personality Bob Gordon, who, being bereft of sponsors, passed arid afternoons teaching us how to make bow ties out of dollar bills, a pointless enterprise as those so flushed would likelier trade the skin for Aurora's latest monster kit. 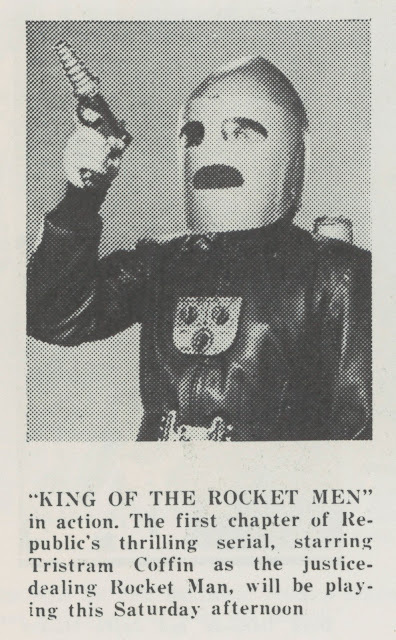 King Of The Rocketmen had distinction of once playing Channel 12 and a downtown Winston-Salem hard-top at the same time, which must have thrown home viewers (let alone admission payers) for a loop. Now it flies nowhere other than gray-market dealer tables and under (online) radars, a loss ongoing as Rocketman is among super heroism's great low-tech creations. 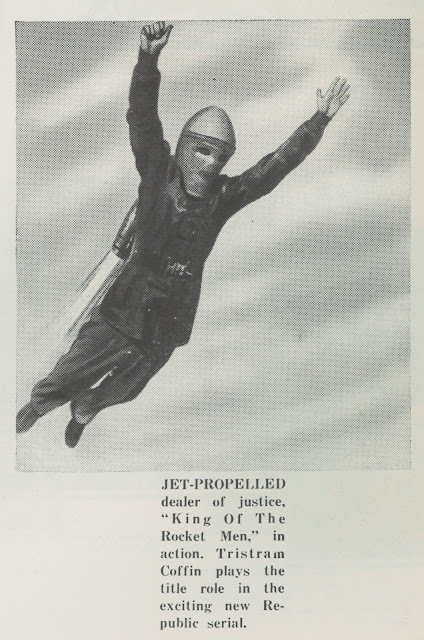 We're misled from main titles, what with King Of The Rocketmen implying armies of same answering to a "king" among them, when it's actually Jeff King in lone possession of the flying suit and except for one chapter, the only cast member to don it. Such was amiable deception practiced by Republic upon fans. Both knew limits of resource available to serials. Gratitude for fanta-crumbs in a barren 40's marketplace would forgive many a shortcut (Republic's reliance on stock footage) and outright cheat (much of what Columbia chapter-plays tendered). How flight was managed seems childishly simple, so why was just Republic able to achieve effects so well? Part of explanation was brothers named Lydecker who oversaw FX and could make rigged dummies on a wire look like sky-staged ballet. Why couldn't TV's Superman give us as much? Budget crunch diminished all things airborne by a late-40's (and certainly 50's) serial decline, and I'd like knowing just what it did cost to make Rocketman fly. Somewhere I read the whole serial finished at a mere $165K. Block-and-tackle assist got down Jack Mathis' Valley Of The Cliffhangers (still the heaviest book I own) to supply back of camera info. Turns out Republic's major concern was possible Rocketman overlap on characters having taken prior wing, including Superman, Captain Marvel, and others of super humanity's brotherhood. Republic's rocket suit is stripped down to barest essential ... just a flight jacket, back-strapped propulsion cones, and a bullet-shaped helmet (or, as Ann refers to it, a galvanized bucket). Operation is simplicity itself. There's up, down, slow, and fast, a concept youngest watchers understood and imagined they could master. Therein lies much of Rocketman's eternal appeal. His fans grew up to recreate the costume (in minute detail) and build models for display at sci-fi and serial cons. I wonder how many amateur Rocket remakes were done on 8mm. Tristram Coffin played Jeff King. He also did single line character work, often uncredited, for the majors when not soaring off at Republic (Tris is glimpsed in The Fountainhead, released within months of starring as Rocketman). A 1976 cowboy clutch in Nashville found me elevator riding beside TC with ample time for him to sign the Chapter One lobby card I'd brought. Could he have imagined in 1949 that Rocketman would confer him immortality? Like many previous chapter-thrillers, King Of The Rocketmen dabbled in kooky science. There are explanations, given in haste, of what power varied death rays possess and how one might level a major city. The "decimator" is KOTR's locus of conflict. 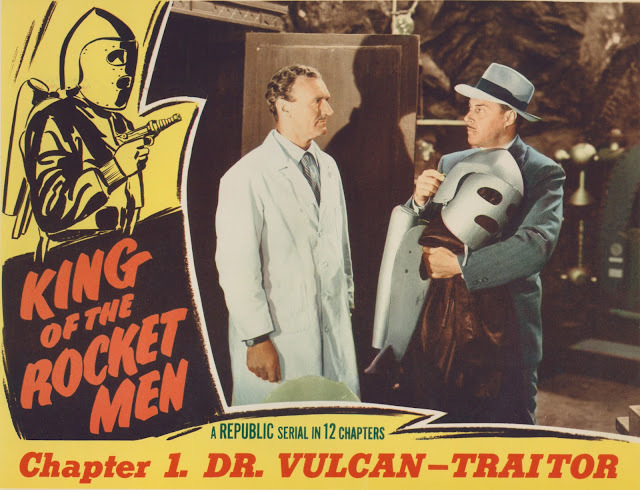 Rocketman Jeff has it and Doctor Vulcan wants it. Momentum flows thus for twelve installments at thirteen minutes apiece, Republic serials having shrunk appreciably since a war's end and a peacetime curb on spending. This decimator is a device powered by double-talk, or more specifically, "high-frequency thromium waves radiating through the coil resister." I Google'ed thromium to see if there is such a thing. Apparently, it does have something to do with atomic power. One of the links was in Chinese, so it's possible I've stumbled onto top secrets and now they'll have to liquidate me. There's no better fortification for serial heroes (or villains) than autos they drive. All look like tanks. Tris pops the trunk and suits up, then stunt magician Dave Sharpe bounces off the trampoline and away Rocketman goes. Most fisticuffing is between Tris/Jeff and revolving henchmen, his alter-ego helmet making it near impossible for heavies to get a decent lick at Rocketman. The latter's great in flight, but slugging aground tends toward the awkward, one of myriad reasons far-out costuming could hobble a hero. Doctor Vulcan, unmasked during the next to final chapter (itself an anomaly), scores total victory in #12 by flooding New York City with the stolen decimator, perhaps the only cliffhanger occasion where a criminal mastermind not only achieves his nefarious goal, but surpasses it. NY's destruction is conveyed by way of knockout footage borrowed from 1933's independently produced Deluge. 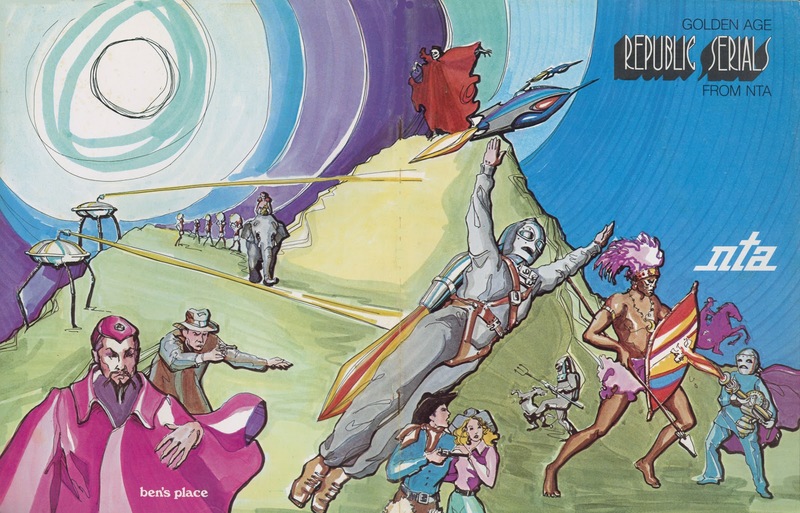 Republic had used the segment before and knew it would make a stunner pay-off for King Of The Rocketmen, but what of their title character's failure to stop the calamity in time ... did youngsters circa '49 figure Gotham had it coming? Yes, John--but how was Mae Clarke? Kind of sad to see a true favorite--a true original--from the 30s fallen so low. Long way from Waterloo Bridge to Republic. I remember watching episodes of Rocket Man on Denver's KWGN as a child. I badly wanted that jet pack until about episode eight when I noticed how weightless and flimsy it really was and how it wobbled around whenever Rocket Man made any sudden moves. Up to that moment I believed the jet pack was real, talk about a major disappointment. Knowing it was make believe did not stop me from watching Rocket Man episodes whenever they were on because I loved watching him fly. As you point out, he did it so much better that Superman. Thanks for bring attention to KING OF THE ROCKETMEN. 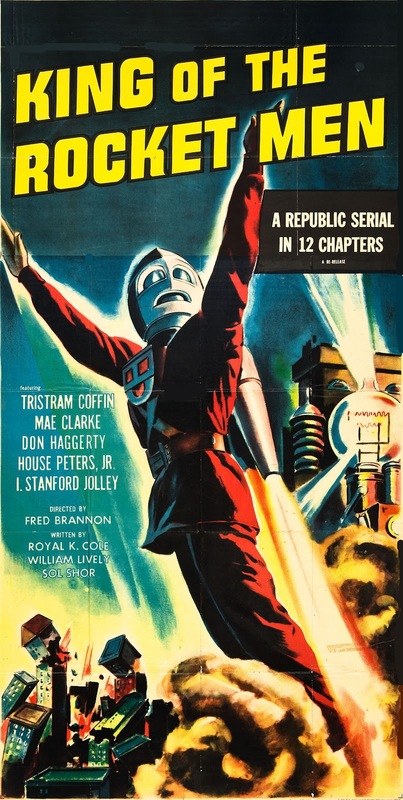 It has always been one of my favorite Republic serials. Apparently, Jeff King came from a very "royal" family, as he had a Republic cousin Dave who was both KING OF THE ROYAL MOUNTED and KING OF THE MOUNTIES, a cousin "Slingin' Sammy" who was KING OF THE TEXAS RANGERS, a cousin Steve who was KING OF THE FOREST RANGERS, and a cousin Bert who was the KING OF THE CARNIVAL. I also love the ROCKETMEN score. The theme during the opening credits is my favorite from any Republic serial. Mae Clarke was getting a little long in the tooth by this time. I would have preferred Lorna Gray or Adrian Booth (either one would have worked better for me - I could never decide which one I liked better, just like Jacqueline Wells or Julie Bishop), but I guess we can't have everything. And the flying effects, sans rear projection for the close-ups, remains incredible. My favorite line of the show comes at the chapter one cliffhanger (and I'm paraphrasing)..."If that bomb goes off in a populated area, you'll be guilty of mass murder." John, you've plucked my heart-strings big-time. 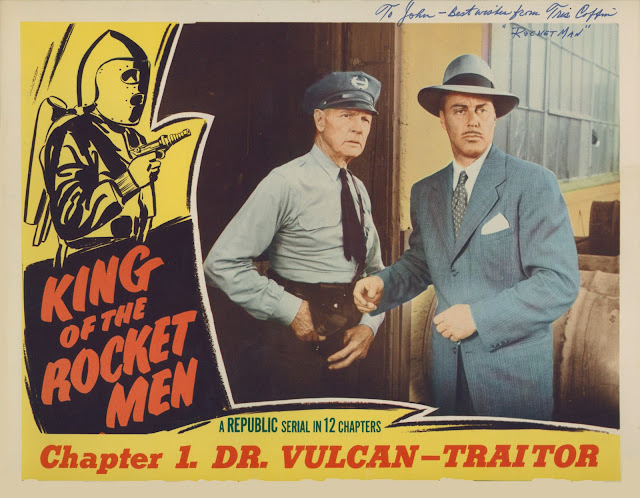 I saw King of the Rocket Men during it's initial theatrical release at my favourite neighbourhood theatre at my favourite Sat morning kids show. I loved it then and I love it still on DVD. I thought Tristram Coffin was the perfect good guy and was not until later learned that he usually played the heavy and that this was one of his few starring roles. I'm always pleased to see him show up in smaller roles in other serials and doing walk-ons in major studio pics. 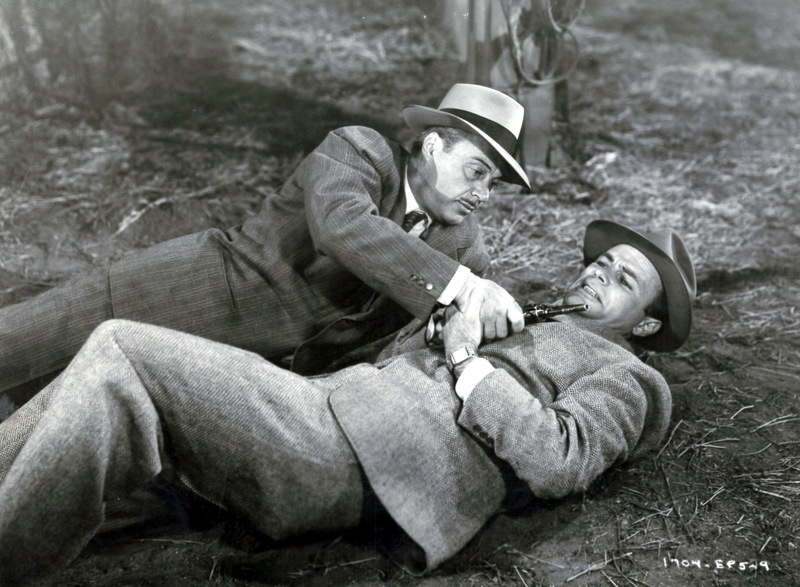 I saw him just last month doing a few lines in a big MGM musical on TCM - I can't recall the name of the picture, but I sure remember Tris. I had limited regard for western or jungle serials but I loved KOTRM because it was science fiction. This, of course, was all before TV had arrived in Western Canada and theatrical exhibition was still the best game in town. A time I recall with great fondness because it afforded me so many opportunities to experience things that were then "brand new" and fresh - the thrill of first discovery, a theme which runs through so many of your best postings John, in which you ask "what must it have been like to be in the audience when this was new?" I still value so many of these experiences becasue they can only happen once: going to the first drive-in theatre opening in my area, aching in anticipation to get at least one parent to take me to see "House of Wax" in 3D on initial release (WOW), seeing CinemaScope (The Robe) for the first time (Breathtaking), same with Todd-AO (Impressive) and VistaVision (so-so). And of course, Sat morning serials! Do they say how he became King of The Rocket Men ? Is it a hereditary title, are there other Rocket Men and Rocket Women with little Rocket Children ? Mae Clarke talks about Rocketman in a fine book by James Curtis wherein she covers the whole of a fascinating career. It's called "Featured Player" and I recommend it highly. Mike, I'd never thought of those (many) other Republic serial "Kings" as Rocketman/Jeff's cousins, but why not? McT, to have grown up in the early-to-mid fifties as you did ... must have been rapture. Will, I guess he became Rocketman just by being Jeff, and having all those cousins who'd gone before him. Onscreen nepotism was rife at Republic! Films of such vintage in mainstream theatres in New England(With exceptions)would have been unthinkable by the 60s-70s, save the novelty of a late 40s-50s Stooge short as an extra. Gee, I thought that was Rocketman's mother in the top photo! Seriously, I recall seeing this serial on TV in the early '60s and was totally enthralled. It was around the same time I also liked THE ABSENT MINDED PROFESSOR for all the flying flubber sequences. Anything soaring in the air was fine by me! I wish I could like serials. I've tried. I've really tried. Maybe it's a gene some people have that some of us don't. A few chapters in, though, they always collapse for me in a pile of silliness and hoke. I booked Captain Marvel from NTA in 35 mm in the mid eighties for a theatrical run in Missouri. NTA had a nice theatrical division that had a rather large collection of Republic produced and / or NTA owned product, including some cartoons. I remember my first view of Rocketman was when, as a kid in the late '50s, I once crept out of bed in the wee hours, curious to see what might be on TV at that time of night. I turned on the set and the sight that appeared was a Rocketman flying sequence! I was astounded at what I was seeing. My local TV stations never showed serials, so I had no idea who this flying guy with the cool-looking helmet was. My parents quickly yelled at me to get back to bed before I could learn more about what I had discovered. I didn't have a clue until a few years later when I read about the Rocketman serials in Screen Thrills Illustrated. I have no idea which Rocketman serial that flying sequence was from, or why the serial was being aired at such an unfriendly hour for younger viewers. Didn't the feature version of KOTRM ("Lost Planet Airmen") change the attack on New York City to a "speculation" of how Dr. Vulcan's plan would destroy the city? I seem to remember some re-editing to make it appear as if Rocket Man saved the city in time. In the 60s, a bit before the Batman camp craze, a local San Francisco station ran a show called POW, where a dryly funny host named Rolfe Peterson would do interviews, present jazz acts, and always close with a serial episode. He usually added a low-key comment after each episode -- I remember they had Flash Gordon and he suggested the actor playing the King of the Hawkmen was cast not for his acting talent, but his willingness to slap a live bear. It was Sunday afternoons and I naturally missed weeks; had to wait until VHS to see any serial in its complete form. 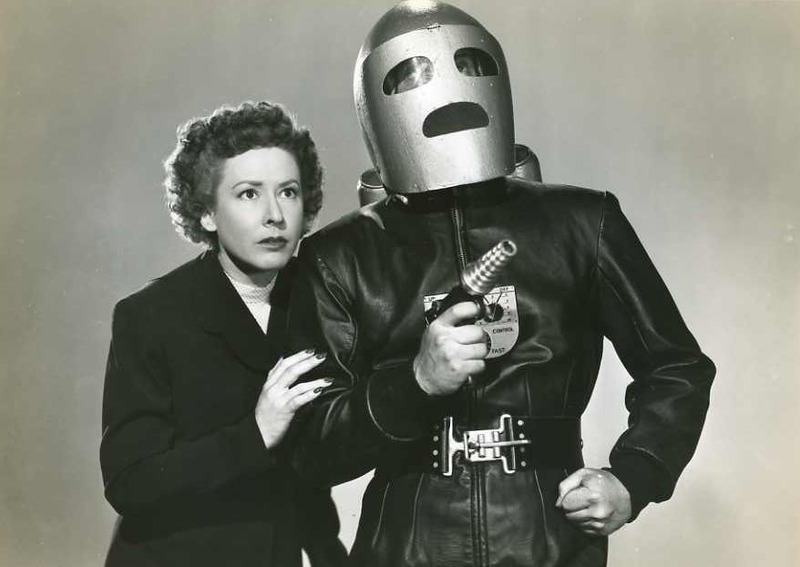 Only Rocketman serial I've seen is Radar Men from the Moon, a very late, rather sullen entry. Severely underpopulated and looking too much like an cheap TV cop show, except the cars seemed more like early 40s than postwar (to match old chases and crashes). It was exactly the sort of thing you expected to find after all the other stations had signed off and you were trying to forget the monster movie you just watched before risking sleep. I first became acquainted with Republic serials in 1966, when Channel 48 in Philadelphia began showing chapters of Daredevils of the Red Circle as part of its Saturday morning programming. I liked it a whole lot, but since I had to settle with my newspaper route manager around the same time, it's problematic as to how much of it I ever got to see. Apparently enough other boys did get to see it to make it a going proposition, so Channel 48 continued showing serials on Saturday mornings. I came to understand that Republic heroes were usually well dressed, in suit and tie and topped with a fedora that was never dislodged, even in a fist fight. 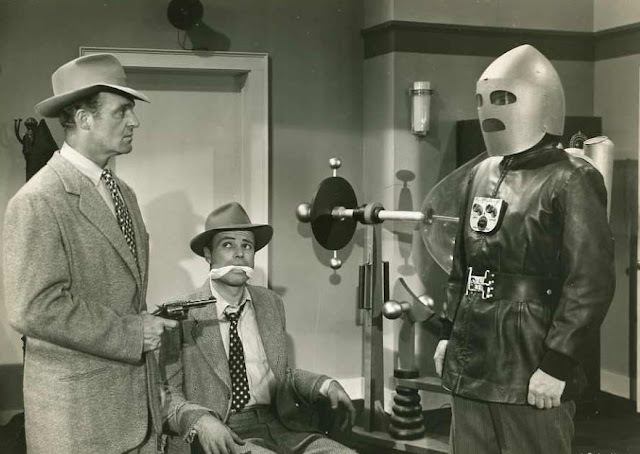 The Rocket Man outfit nicely complemented the usual costume, the leather coat substituting for the suit jacket and the helmet for the fedora. We can assume that the tie remained in place under the coat. 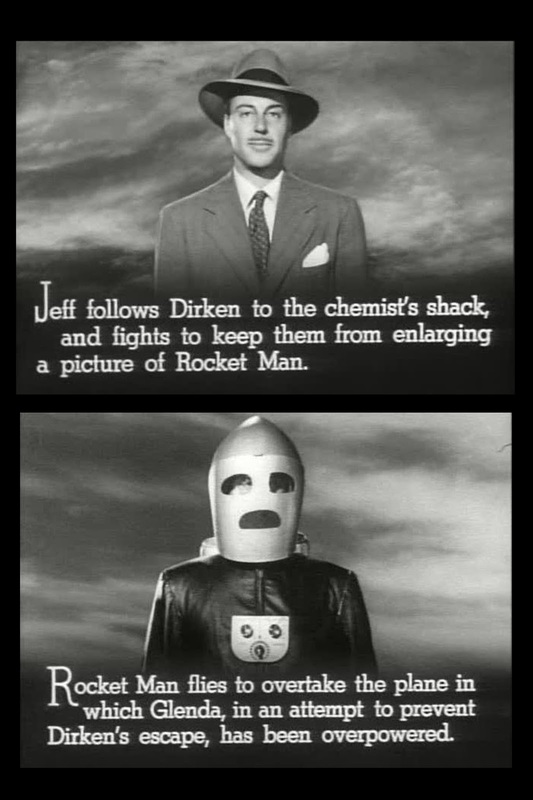 As your pictures show, Jeff King continued to wear his trousers and brogues as the Rocket Man. Evidently, the long-wearing gabardine of the trousers was perfect for a flight suit, and if the cuffs on the legs were not the quintessence of aerodynamic cleanliness, they might have functioned as auxiliary control devices. The bullet-shaped helmet gave an aggressive, streamlined appearance, but only when he was looking at the ground while in level flight. If he were to look ahead to see where he was actually going, the streamlined effect would have been negated, since he would have had to have titled his head upwards to do so. Dave Stevens got this part of it right when he created "The Rocketeer" as an homage to the Rocket Man, his helmet being a close fitting one with a fin on back, for guidance. The panel for the "mouth" had no function at all, of course, but it did lend a certain character to the Rocket Man persona, albeit a smug one. As you and your readers have indicated, however, even an astute child could see that the rocket pods were flimsy things attached to the leather coat itself, rather than a harness, while the controls were rudimentary in the extreme. I might suggest, however, that the Lydecker brothers were actually being used by the U.S. government as conduits for secret technology. The notorious Rosewell incident took place just a few years before, when the Air Force supposedly recovered a crashed flying saucer from the desert outside that town in New Mexico. No doubt the "rocket pods" were actually anti-gravity devices, while the controls activated micro-processors which gave effect to the subtle variations between "up" and "down," and "fast" and "slow." The idea was to suggest to the American public the wonders of super science from other worlds, even in such a silly form, so that they would not be frightened when the "shocking facts" were finally disclosed. Oh, you don't think that that has anything to do with this serial? You think that there are aspects that look absurd just because no one took the trouble to figure it out? Well, you're probably right, but as to the Lydecker brothers' contribution, their technique of photographing a full sized figure in natural light, suspended from a trolley in apparent flight, resulted in an effect that looks far more convincing than anything yet done with CGI. No doubt that's why King of the Rocket Men made such an impression on so many boys, whatever generation they belong to, because its appearance of reality, with all its outlandish glamour, allowed them to suspend their disbelief and let their imaginations lead them into the adventure. Thank you for writing about the Rocket Man. 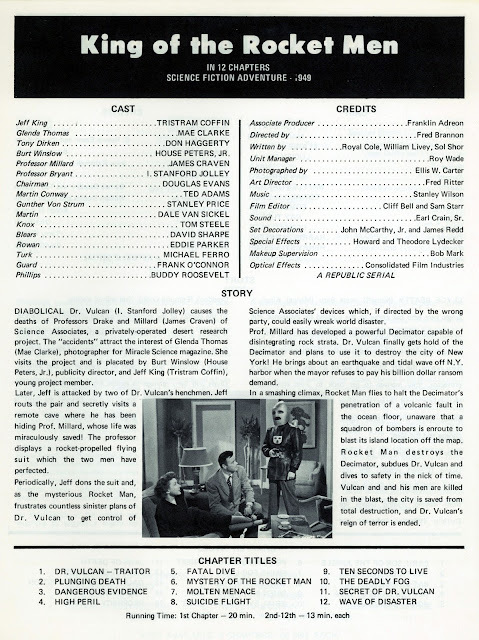 My very first serial was Zombies of the Stratosphere, which a San Francisco tv station showed as a campy item on a Saturday night magazine show, probably in the late 1960s. I would watch it after dinner at my grandparents' house. I wanted a rocket suit. Who wouldn't want that rocket suit? Since New York is destroyed in the last chapter, I find it amazing that Jeff King/Rocketman is treated as anything but an abject failure. The mayor seems giddy and glad at the chance to rebuild the city, overlooking the human toll taken by Jeff's failure. Wonderful column, with plenty of your trademark badinage, on "...Rocketman". I mainly saw this in bits and pieces, much as you describe, in the late '50s and early '60s. Time's accretion has blurred when and where, but I'd certainly suspect Saturday morning programming, which was the place many stations aimed these old surefire kid magnets. As you say, the mysterious Lydecker brothers (because I never saw a picture of them, and never saw a behind-the-scenes shot of them at work) did wonders for Republic. I'm convinced that the 'secret' of why their flying effects were so convincing to kids back then is hiding in plain sight: they shot them outdoors! The 'lighting' was the sun. It looked real, because in every important respect it was real. Otherwise of course you're always seeing a stiff dummy. How they either hid or charmed us into collusion that we didn't see the supporting wires, I'll never know for sure. I'm guessing these were big 'miniatures', maybe two to three feet long, out of the necessity of hiding those wires by making them look relatively thin. That's a no-brainer analysis for you. It also helped immeasurably that you'd see glimpses of rocky outcroppings in the shot with the Rocketman, and being relatively familiar with the drive-to opportunities for such scenery in greater L.A., I'd immediately peg these as the still-extant rock formations out near Chatsworth, CA in the San Fernando Valley, which appear in so many movies made by so many studios, major and minor, that I wouldn't dream of guessing how many. One imagines 'the brothers' could have buzzed out there, set up a rig about as sophisticated as a clothesline, popped on little 'Rocky', let him scoot down as many times as it took to get the shot, and maybe even move the camera around to get other angles. Then, voila, finished. Not having seen any of these in ages I can't remember if there ever were that many variations in his flight patterns or even the shots themselves. They may have filmed a small suite of variations and just cherry picked them for the rest of the serial as deemed appropriate to the situation. I sense in between the lines your admiration, which is typical of us smarty-pants former childhood enthusiasts---plus, a loyalty to---the small-budgeted enterprises which still managed to show or suggest so much in spite of having so little at their disposal, save ingenuity. I was struck by this the other day in a very different sort of context. Well, not "very" different! I'd been reading about the apparently immortal Kirk Douglas's recent appearance at the TCM Film Festival over the past weekend in Hollywood, in conjunction with a [digital] screening of "20,000 Leagues Under the Sea". This is such a superb production that even the mention of it brings forth good feelings, about Jules Verne, Walt Disney, and the '50s! I'm trying to get to the connection here in my usual verbose way. I'd just finished re-watching one of my other favorite movies on its limited-edition Blu-ray, namely "Mysterious Island". Due to this coincidence I had to marvel at the way that Charles Schneer, often reviled by some collaborators as a ruthless pinch-penny, still managed to produce a movie (with the inestimable help of Ray Harryhausen, who he alone seemed to recognize for his incredible value) that rivals the first one, even though he undoubtedly had a fraction of the funds. In fact, overall I prefer "Mysterious Island"! And, as far as bang for the buck, the earlier George Pal sci-fi epics and even the charming, smaller-scaled "7 Faces of Dr. Lao" also spring to mind as exemplars of what can be done with quite a little when the man in charge knows his onions. Craig, Bob Burns will tell you that big miniatures and natural lighting were indeed the secret to the Lydecker's rock solid effects work. From the 8 foot Captain Marvel mannequin to the large miniature space, air and water craft they used in Irwin Allen's various 60's TV shows. Big ships with weight don't shake much when they move down those wires. There's a book called "Poverty Row" that features an interview with Theodore Lydecker. (Howard had already died.) He explained that their miniatures were built at a scale of an inch to a foot (1/12 scale) and, yes, were shot outdoors. The wires used to propel the flying models (and the Captain Marvel and Rocketman figures) were painted sky blue. The plane sequences in "Flying Tigers" were done mainly with Lydecker miniatures and were so well done that Air Corps personnel were fooled (according to Theodore). I am just seeing this string. Regarding KPIX's POW! the host and creator was Rolfe Peterson, an affable, smart and witty guy. I got to know him because though in high school I would write him with ideas for the show. And he invited me to be on the show a couple of times. He played mostly public domain serials, mainly from Mascot. The favorite was Gene Autry in THE PHANTOM EMPIRE and he even issued small posters inducting the holder into the "JR. Thunderiders of America." I have one still. And we loved that serial. My dad was in the Air Force with Autry station in Arizona. They shared bunks but I don;t think Gene went overseas and my dad did. When he opened the Gene Autry Museum in Los Angeles I got him to sign a Belgium poster for PHANTOM EMPIRE. The show featured early performances by bands like Jefferson Airplane and Janis Joplin with Big Brother and the Holding Company.